Anytime I travel to a new place I always consider the livability factor. I always ask myself, “Could I live here?” I think this may have something to do with living in the same place all my life and trying to find that perfect place to move to. This may also account for my travel obsession; I’m actually just trying to find a new home for us. Most places have more cons than pros and the answer is usually no. With our recent trip to Glacier National Park in Northwestern Montana I asked myself the livability question once we got there. And the answer was a surprising yes. Truthfully, I had not expected to be too excited about Montana. I had heard great things about Glacier National Park, but everything I had imagined for the rest of Montana was cowboys, cows, and cow pastures filled with… cows. But I was surprised to find Northwestern Montana to have the same Pacific Northwest forest that we have in Oregon, but it also had something different. It has the deep U-shaped valleys carved by massive glaciers, whereas in Oregon where there were no glaciers, the valleys are V-shaped and carved by rivers. But what I found to be truly magical about the area was how pristine everything was. It really reminded me of Western Oregon and Washington 30+ years ago before the huge influx of people and strip malls. The people that we met in Montana were down to earth and very friendly and there were still a lot of small mom and pop stores, something that is hard to find in modern America. The big box stores and strip malls could still be found in the town of Kalispell, but the smaller towns in the area still had not been exploited by the big corporations, except for the occasional Subway. When I was a kid we would watch nature films in grade school. The teacher would load the film reel onto the projector (I just dated myself here) and we would watch exciting films about the beaver, the bear, or the spawning salmon. The forests and streams in those films were pristine and wildlife aplenty. It was the way the Pacific Northwest once was, and sadly, is no more. But as we drove into Northwestern Montana along highway 2 from Idaho, the pristine forests, rivers, and wildlife that I remember from those old films appeared before us. We had found a place where it was still like that. Besides the natural beauty, Northwestern Montana has something else that hit a weakness of mine. There are massive freshwater lakes with small marinas filled with sailboats. I am a sucker for sailing and sailboat racing and the sailing looked good there. I mean, REALLY good! As we were driving by Flathead Lake, which is the largest freshwater lake west of the Mississippi and is 200 square miles in size, we noticed a sailboat race underway. I easily pictured myself out there on a boat of our own. Of course, we were visiting Northwestern Montana during the summer when sailing, hiking, and rafting are easy. But during the winter this part of Montana is covered in deep snow and offers plenty of great skiing and snowmobiling, something else that we really enjoy. And I would love to photograph Glacier National Park in the winter. While living there now is not really an option as we have committed ourselves to other plans, I could see us living there once we reach retirement age. A cabin on a lake with a sailboat mooring sounds very nice. Let’s just hope the area stays the way it is. Glacier National Park is well known for having plenty of wildlife. Although we did not see a bear while we were there, we did see most of the other creatures. Check our some of our photos. My family has stopped giving each other gifts for birthdays and Christmas. While this makes us seem like we are all a bunch of selfish uncaring Grinches, it is actually a good thing. Instead of giving and receiving gifts that people may or may not want, the money that would have been used for those gifts goes towards a travel fund. The money is to be used for activities and other costs during family get togethers. This past week we were in Glacier National Park for a family get together where we all had the chance to use the travel fund money to do some exciting activities. I thought I might share some of the activities we did. There are some great opportunities for rafting around Glacier. 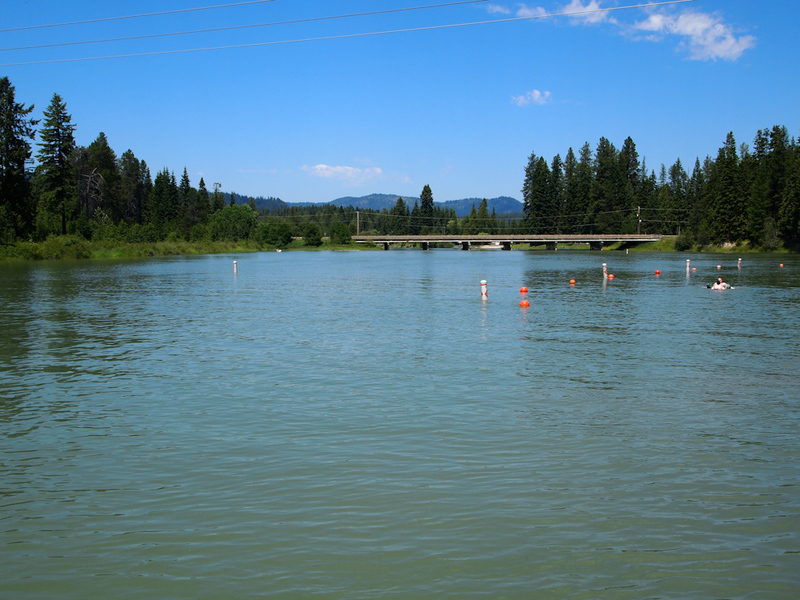 Rafting is available on the Middle and North fork of the Flathead River. 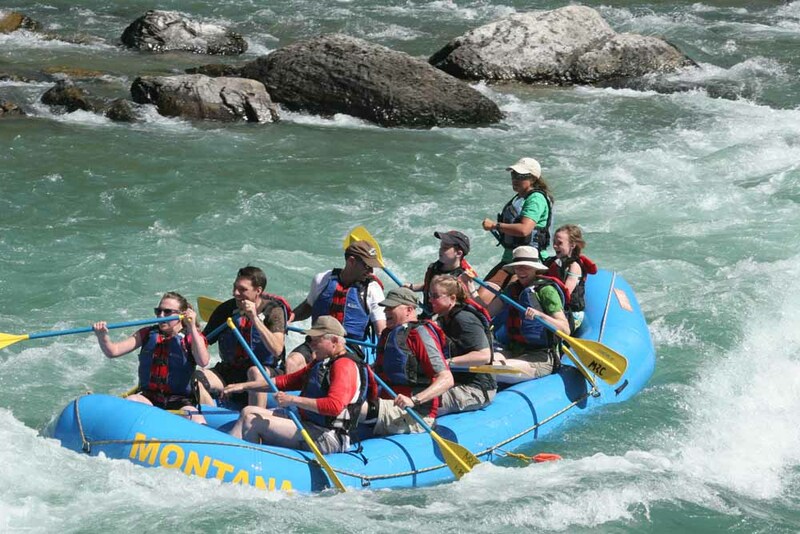 We choose to go on a half-day guided rafting trip on the Middle Fork with the Montana Rafting Company. The half-day trip along the Middle Fork has around 10 class 2 and 3 rapids and is perfect for anyone 7 years or older. There are plenty of opportunities to get wet with the ice-cold glacier melt and possibly see some of the areas wildlife, so the trip is far from boring. There were several calm areas along that river that one can go swimming, if you dared. The water is definitely cold, ranging around 50 degrees, and Sydney was brave enough to jump in 3 times. 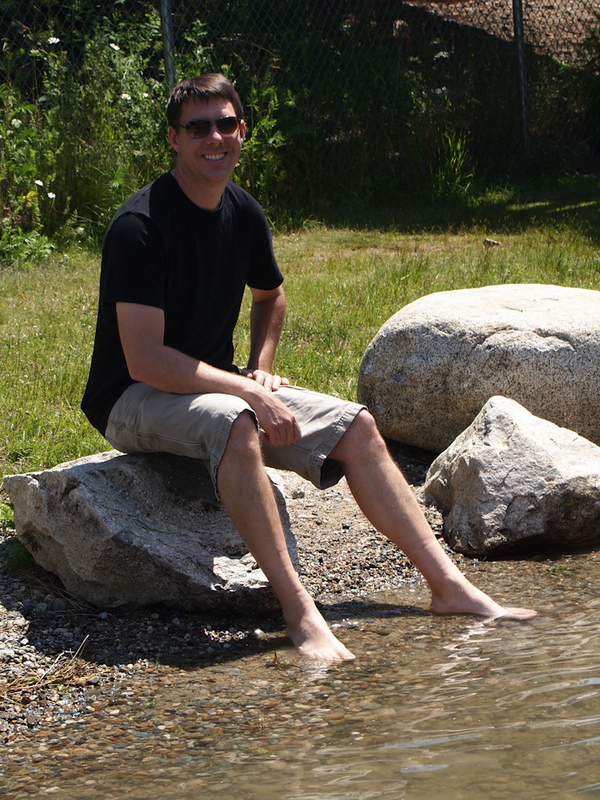 I, however, had no desire to jump into the water even with 90-degree weather. We had a blast whitewater rafting and it was definitely worth the money we paid. Our neighbor in Portland is from Montana and before we left he recommended going on the Red Bus tour. This was on our list of things to do; after all if a local is recommending it and has actually taken the tour, it’s got to be great right? Well it was. Even though it is expensive, I would highly recommend taking the Red Bus Jammer Tour. 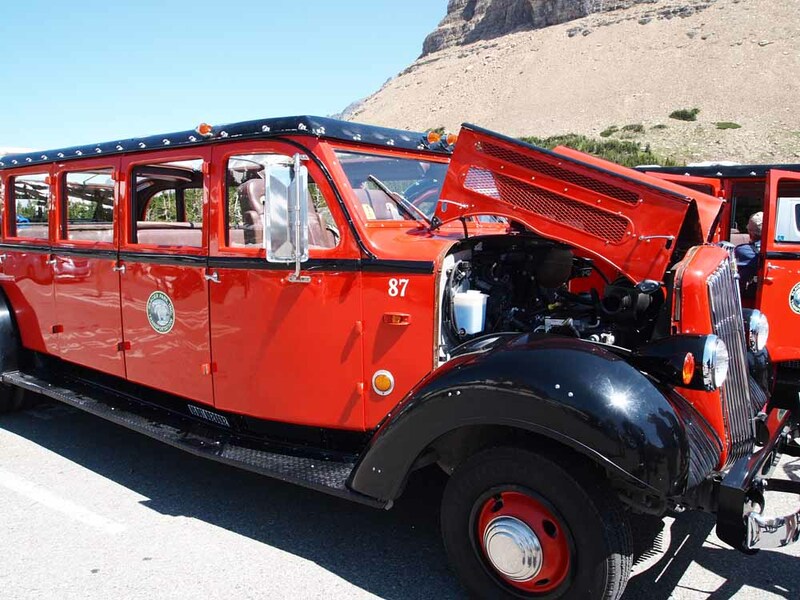 The Red Jammer Bus Tour was started in the 1930’s and is an open top bus that offers several scenic drives through the park. We choose to take Going-to-the-Sun Road tour. This tour takes approximately 4 hours and makes several stops along the way including Logan’s Pass. The views are phenomenal as it is an open top bus, no car top to limit the views. Having someone else drive also allows time to soak in the scenery without the worries of trying to drive the road. The Going-to-the-Sun Road is very narrow with many curves and sheer drop offs, which can be a bit unnerving. The Red Bus is a marriage saver, as it will eliminate all conversation about being too close to the edge or taking the curves too quickly. 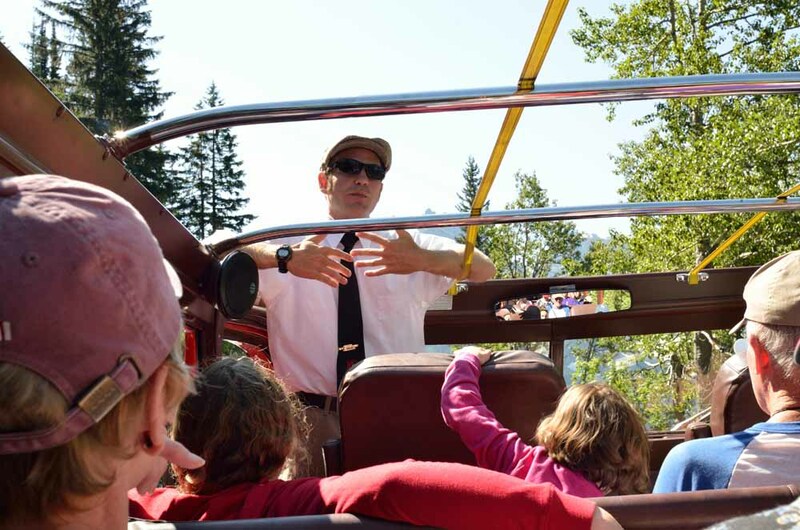 The driver provides narrative along the way, pointing out interesting views and facts and is knowledgeable about the park history. At Logan’s Pass, we were able to see wildlife that I thought I would never see and Sydney enjoyed playing in the snow, and of course throwing snowballs at family. If you are planning on taking this tour definitely bring water, coat, and a hat as temperature varies from cool to hot. There are lots of options for horseback riding in and around the park. We choose to go horseback riding inside Glacier National Park through Swan Mountain Outfitters. Swan Mountain Outfitters have several stables in the park with many ride options ranging from 1 hour to whole day rides. We choose the 2-hour McDonald Creek ride, which left from McDonald Lodge coral. The ride winds through an old cedar forest and then crosses over McDonald falls. The views are great and it was cool under the forest canopy despite the 90-degree heat. However this is also a typical nose to tail ride. Don’t except to trot or be able to go off on your own. It was not nearly as much fun or cheap as our free spirited Costa Rica horseback adventure last year. The wranglers are knowledgeable and the horses are well taken care of, unlike many we have seen in Mexico. As I have not done a lot of horseback riding, 2 hours was plenty. I found that after the ride, it was not my bottom that hurt but my knees. Walking after horseback riding is always comical. Glacier offers miles and miles of trails for all levels, but unfortunately, we only had a limited amount of time and did not get to go hiking as much as we would have liked. We were able to hike the popular trail to Avalanche Lake. 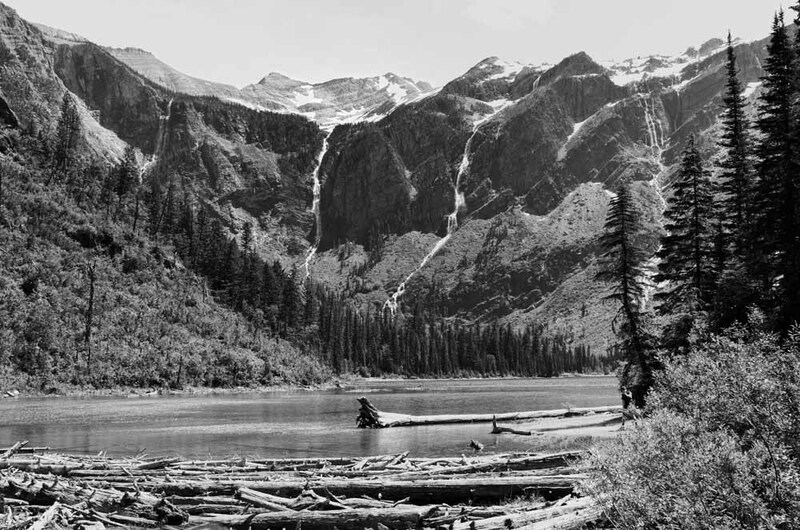 Avalanche Lake is a 4-mile round trip hike and is a gradual uphill climb to the lake. This hike is great for all levels as the trail is well maintained and does not have a huge elevation gain. Avalanche trail starts at Avalanche Creek, which then winds through cedar forest and ends at a beautiful glacier fed lake. There are multiple waterfalls cascading into Avalanche Lake and the water is that unique blue color caused by glacier flour (ground rock.) Sydney enjoyed wadding into the lake and we also had a nice lunch at the water’s edge. Though there are many hikers along the trial, wildlife can be seen. On the way out we talked with a forest ranger who said that there had been a Grizzly bear spotted around the lake earlier that morning. The hiking is free, but it cost $25 for a one-week pass to enter the park. This was a surprising delight and well worth checking out. Alpine Theatre Project is located in Whitefish about 30 miles from West Glacier. Alpine Theatre puts on productions ranging from classical music to dramas. What makes this theater unique it that the actors are from Broadway and other major theaters around the US so the acting is amazing. The theater is small and every seat in the house is a good seat. We decided to see Little Shop of Horrors and everyone enjoyed it. 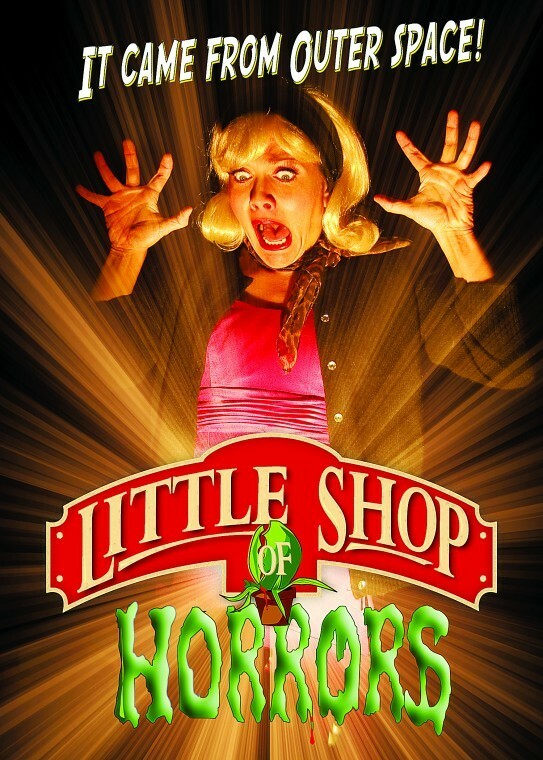 After the play, someone tapped me on the shoulder and offered for Sydney to go up and see the plant, Audrey 2. She was able to open the plant’s mouth and sit in it. I was also excited to learn that the next play will be Hedwig and the Angry Inch. Hedwig, though not children appropriate, is one of my favorite movies. Unfortunately, I have not been able to talk Jason into driving back to Montana to see it. Glacier was a beautiful place to visit with many fun activities to do. Pictures cannot even begin to capture the beauty and awe inspiring sights. This is a must see place and we could have easily spent several more weeks exploring. Sadly, we only saw a small fraction of the Park and were sad to say goodbye. When heading to Glacier National Park in Montana we were really hoping to see some wildlife. The first few days we did not see too much, until we went to Logan’s Pass. There we saw a bunch of wild bighorn sheep, mountain goats, marmots, and lots of ground squirrels. Our favorite photo of the wildlife is this bighorn sheep. My family gets together every couple of years for a family reunion. For each family reunion we choose a different location around the Western half of the United States and were really excited that the family had chosen Glacier National Park for this years get together. Jason and I have never been to Montana before and were looking forward to seeing a new place. In fact, Jason told me on the trip out that besides Crater Lake (Oregon’s only National Park) he has not been to another National Park. In planning for our trip, we had noted that the drive from Portland to Glacier is approximately 11 hours, We decided to break it up so that we could have plenty of time to stop and explore. After rushing around to complete all the last minute house projects we hurriedly jammed some stuff in our bags and were off. Unfortunately in the haste, I forgot many essentials such as my prescription sun glasses. I have since regretted packing so hastily as the Montana sun is very bright. It was weird leaving, as this is the first road trip without Sydney since she was born. Sydney had been visiting with my parents in New Mexico with the plan that they would be bringing her up to Glacier. The first evening, we drove up to Spokane and arrived around midnight. I am glad that we broke the day up as the first part of the drive was partly in the dark. Though, the Columbia River Gorge has some pretty views, the freeway quickly leaves the scenic gorge and enters into dry rolling hills of sage and farm fields. We have done the drive multiple times along I-84 and both find it boring. The next day we were off again. After leaving Spokane, the scenery gradually gives way to high mountain pine forest and is beautiful. We purposefully planned our route to go through Priest River, a slight detour from the most direct route to Glacier from Spokane. 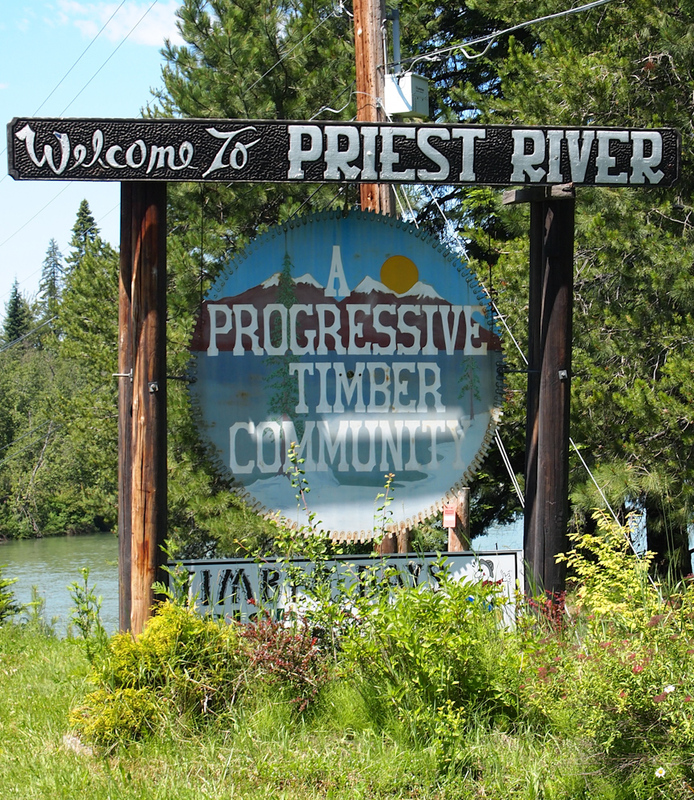 30 years ago, Jason’s family owned 5 acres of thickly forested land near Priest River and has some great memories of exploring the area when he was 11. When we arrived at Priest River, Jason attempted to find the unimproved road that the property was located on, but unfortunately we were not able to locate it. He remembers the Priest River as being the clearest river he has ever seen with specs of fools gold sparkling as it drifted by in the current and being able to clearly see the brook trout 10 feet down on the bottom. People were living in school buses and walking around with rifles because of all the grizzly bears. The area has really changed and now has lots of nice modern houses and cabins, and no more school buses. After our unsuccessful attempt to locate the property, we took a break and enjoyed dipping our feet into the icy cold river. This was refreshing as the temperature was 90 degrees and the sun was intense. Priest River. Not as clear as it was 30 years ago. After we entered into Montana we noticed a pull out along the roadway up in the mountains along highway 2. The car thermometer was showing 100 degrees outside but we decided to stop anyways. We were just going to stop to stretch our legs as it was so hot, but noticed a sign for Kootenai Waterfall and hanging bridge. After a short hot walk, we arrived at the falls. The pictures do not do it justice. The amount of force of water was impressive and the spray lowered the temperature at least 20 degrees. We enjoyed the falls for a while and then walked to the hanging bridge. The hanging bridge hangs across above the rushing river. It has a sign that limits to only 5 people at a time on the bridge. We did not walk all the way across the bridge as the swing of the bridge and gaps between the boards was unnerving. The stop and hike was a great decision and we got to enjoy some of the beautiful scenery of Montana. 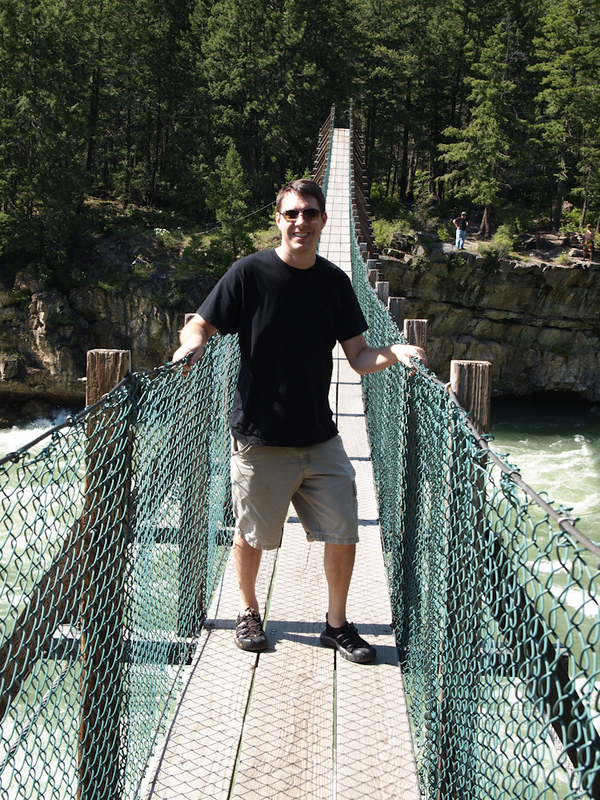 Jason on the swinging bridge. And yes, it does swing! Awhile later we arrived at our destination in Columbia Falls, 15 miles from Glacier National Park. It was great to see our daughter Sydney after two weeks without her and also to see family. 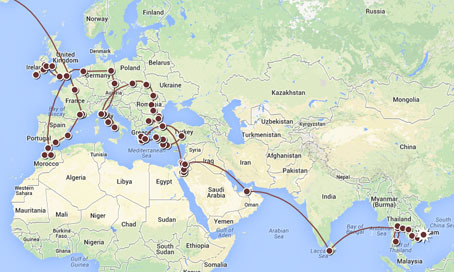 I look forward to our trip back, as we are planning to take a different route home. The sites and scenery along the road alone has been well worth the trip to Glacier.